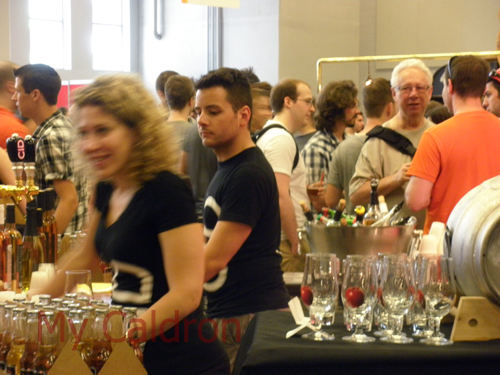 Montreal Beer Fest, held since 1994, from 29 May to 02 June at “Palais de congress”, starts off the summer and its many colorful festivals. I went to it last weekend (for the first time) and found it quite different and interesting: Not much of “festivity” (i.e. music, dance) surrounds this event; but a LOT of good beers and ciders are there to taste, with a variety of snacks and appetizers: From barbecued sausages, smoked meat sandwich, poutine, to freshly baked breads and cakes and many other treats. One Kiosk, called “skippy-burger” was selling kangaroo hamburger, (with a stuffed Skippy sitting on its front counter 😦 Who could eat that, I wondered!? I enjoy your blog a lot. It has been informative and helpful for me. Whenever I need help I just go there and get my answer :smile:. Thanks for sharing the beautiful sceneries you’ve experienced, through nice pictures and films you make :cool:. you more success in the beautiful path you’ve chosen. Congatulations :wink:. As usual you remember things that I do not!